There was double success for Laila’s Fine Foods as the very best supermarket own label food and drink has to offer was celebrated at The Grocer’s annual Own Label Food & Drink Awards at London’s Hilton Park Lane on Friday 11th May. More than 1,000 entries had been whittled down over a rigorous two-stage testing programme involving consumer and expert judges, with the winners announced by Adam Leyland, editor of The Grocer, and TV presenter Stacey Solomon. 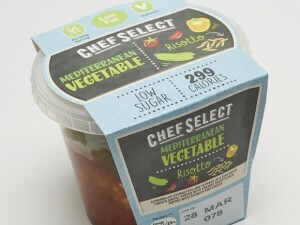 Laila’s Mediterranean Vegetable Risotto for LIDL won Category Champion and the Innovation Award in the Food to Go Savoury category with judges commenting, “Packed with “tasty, crunchy veg” this lunch pot from Lidl impressed consumers with its good health credentials and “colourful packaging”, with 61% happy to recommend it and a fifth (22%) convinced it could make it into their weekly shop. “Fresh and good value for money,” added the judges, with a “good vegetable selection” as well as being “well balanced”. So impressed was The Grocer consumer panel it awarded the Lidl risotto a double innovation star and a top innovation score of 20/20, with 78% saying it was better than other lines out there and 80% saying it offered something different. Judges agreed, praising the “high quality and convenience of the meal” in a design concept that “is hard to do well”. Laila’s Fine Foods Technical & Commercial Director Zera Dawson-Gerrard said: “We are delighted to have received these prestigious awards which are testament to the consistent outstanding quality and innovation of our products and our close working relationships with our customers”.